Since the beginning of time, wizards too powerful to be named have tried to learn all the secrets of the universe. Through millennia they studied and learned and traveled through time and space growing to become the most powerful entities of the universe. And today, after countless centuries they finally met in the battle ground to prove once and for all who is the most powerful. But, after countless years, age has taken its toll. The wizards may be powerful, but only if they remember what each spell does. It is a combat of.. Witless Wizards ! 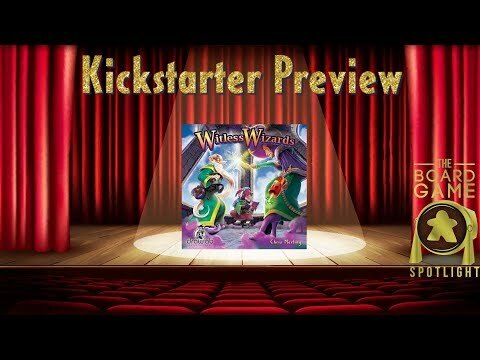 Witless Wizards is a fast and humorous card game for 2-4 players played in only 15-25 minutes. At the start of the game the players choose 3 of the available decks to shuffle together to form a common deck. Each round all players will draw cards from the common deck to equip themselves and their opponents. On your turn you draw cards one at a time and have to decide which player you are going to give the drawn card getting to keep one card for youself and one to an opponent. If you draw a good card, you can keep it for yourself, but perhaps the next card is even better or it makes a great combination for your opponent. Perhaps you need to use some of those concentration cubes you kept to draw additional cards. In order to win, players have to equip themselves with better weapons than their opponents and deal enough damage to be the last wizard standing, declaring themselves the most powerful wizard of all time!